I have read a lot of books, blogs and articles on sewing and fashion, and it occurred to me lately that I never really got the opportunity to be a beginner. Yes I said OPPORTUNITY. Let me explain. First of all, I’m overly ambitious in everything I do, and I have a tendency to jump into the deep end with everything, tackling an advanced project with complete belief that I can handle it even when I have no earthly business doing such a thing, because I’ve never learned the basics like a normal person would LOL. This can work well for me because I have no hangups and no fears, so I don’t hold myself back needlessly. On the other hand, I have learned that I need to temper that with the knowledge that mistakes are OK, and it’s part of the way I have chosen to learn. Some people take baby steps and learn to do each one well before moving on, which builds confidence and basic skills. I take giant leaps and end up fixing giant mistakes as a result, and this can be discouraging if one isn’t positive. So the other reason I haven’t been able to be a true beginner is because I was very blessed to have a mum who is an extremely talented, accomplished seamstress, and as a result, I was quite familiar with fittings and pinnings and the whirr of a sewing machine right from babyhood. She made it look easy, thus I always assumed I could do it too, if I put my mind to it. Again, partly good, partly bad… good as an adult who’s learned temperance… bad as a teenager who just wants instant gratification. So I always tackled projects that were much too hard for me and which my immaturity could not handle, because sewing requires one thing i did not have back then… PATIENCE. I had fluffy cloud dreams of gorgeous, perfectly fitting garments in lovely fabrics, but no concept of the dedication and patience it required to make them come to life. Until late last year, when I finally got fed up with the ridiculous sizing, terrible fit, and cheapness of fabric rampant in RTW these days. I have, as the saying goes, “champagne tastes on a beer budget” and I STILL have fluffy cloud dreams of perfectly fitting garments made of excellent quality fabrics that feel and look amazing. I believe that one needn’t be a Size 0 supermodel to have these luxuries…. real women deserve them too. But that is a musing for another time. I’m probably not going to sew anything “easy” anytime soon. I have accepted who I am and how I do things, but I’m open minded enough to realize I would benefit from going back and re-mastering some of the basics, maybe with a better or more efficient method, so I’m exploring materials aimed at “beginners” with the hopes that I can pretend I don’t know what I already know, and maybe glean some new insight – go back to a simpler time and really spend the time to savour doing the little things really REALLY well. This excites me! I am by nature a detail-oriented person, so being able to focus on the little things is very inspiring and I am feeling re-invigorated by the possibilities ahead. I have decided that this blog space will be my project diary of sorts, and a place where i can post updates on what i’m doing. This has nothing to do with work, this will purely be personal projects only. Right now I’m fully immersed in my fashion passion so this will primarily be a sewing blog (for now). 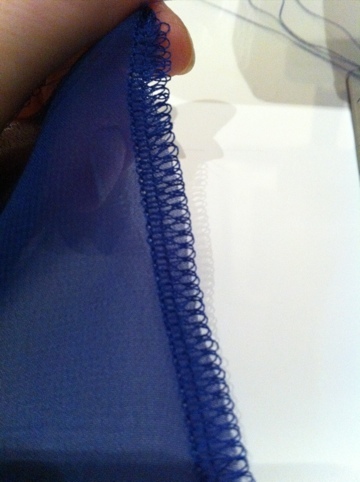 I have recently started a blue chiffon blouse, a project which i am sharing with my mum. We found this fabric on a shopping trip together, and both of us fell in love with it, so we are each doing our own projects with it. It is a heavenly colour… gorgeously jewel toned, and I love chiffon, but it is the first time I’ve sewn with it and it is (as so many before me have lamented) VERY tricky to work with. As with many of my projects, it is a slow process; it’s been about a month since we started this project, and I haven’t gotten far. In my defense, though, there have been some pretty major changes in my life LOL. So far I have managed to trace and cut my pattern, mark pieces, sew darts and pleats, and just last night, I pinned the body pieces together for a loose fitting.